John Gregorek was a member of the 1980 and 1984 United States Olympic teams in the 3,000-meter steeplechase. He set his personal best time of 8:18.45 at the 1984 Olympic Trials. John also was on the U.S. team at the 1987 World Championships at 5,000 meters. Gregorek missed the 1992 Olympics as he finished third at Olympic Trials 5,000 meters but didn’t achieve the Olympic ‘A’ standard. He is a 1982 graduate of Georgetown University where he anchored the 1982 NCAA indoor distance medley relay champions and the 1982 Penn Relays DMR champs which broke Villanova’s 16-year winning streak. He was an 8-time All-American, 6-time Big East champ and 5-time IC4A champ. In cross country John finished in the top 30 twice at NCAAs while also winning two Big East XC titles. 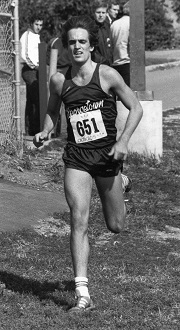 He graduated from St. Anthony’s High School (New York) in 1979 where the two-time State Cross Country champ was the fastest high school runner in the United States in 1978, winning the mile at the Golden West Invitational in 4:05.4 and racing 8:50.7 for two miles. John and his son, Johnny, are the fastest father-son mile duo in history with an average time of 3:52.25. Along with his wife, Chris, John is a part of the fourth fastest married couple mile duo ever with their average of 4:10.17. His personal best times include: 800 meters – 1:49.41; 1,500 meters – 3:35:3; mile – 3:51.34; 2,000m – 5:00.19; 3,000m – 7:41.18; 3,000m steeplechase – 8:18.45; 5,000m –13:17.44; 10,000m - 29:31.4 and marathon – 2:16. John has been inducted into the Penn Relays Wall of Fame, Georgetown Athletic Hall of Fame, the St. Anthony’s High School Athletic HOF and the Suffolk Sports HOF. He coached cross country and track and field for over ten years at Brown University and currently works as a representative with ASICS. He resides in Seekonk, Massachusetts with his wife, Chris, of over 35 years. GCR: John, when you started running over four decades ago could you have imagined being a part of the running community as student-athlete, professional runner, coach, father to a professional athlete and working with a major apparel and shoe company for all these years? When you look back, how amazing is this and how rewarding has it been to have running as such a big part of your life? JG It’s certainly been a blessing to have fallen into the sport. I grew up playing football, basketball and baseball and that was all good being in the team sports. At one time I just fell into running and so many good things have come as a result of that. I met my wife because of getting a scholarship to Georgetown and then having our family. I’ve made great friendships and travelled the world. I had great opportunities to make Olympic teams and to meet athletes from other countries and to broaden my horizons. It’s been a blessing and primarily due to the people I’ve met through the sport. GCR: You made two Olympic teams, but your first in 1980 was the Games where President Carter boycotted. How thrilling was it to finish in the top three at the Olympic Trials and to make the team as a college sophomore, but also disappointing in not being able to compete? JG When I look back on it, having not gone became more disappointing later in life. I made the team and I was really an outside shot. My initial goal was to experience the Olympic Trials. Then at the Trials my goal became to make the finals. Then when I made the final I aimed to make the top six finishers. Making the team was incredible and was completely unexpected. Although I say that, my coach would rebuke me for saying that because before the Trials we had done a lot of physical preparation and mental preparation. But, at the same time, I was only twenty years old and it was kind of a long shot for me to make the team. When I did make the team and knew we weren’t going to the Olympics, I was only twenty and figured I’d just do it the next time, as if it wouldn’t be that difficult to do. We eventually did get to go to the White House and they had a ceremony for us which was great and fun. But it would have been awesome to have gone to the Olympics for the whole experience. I think it would have helped me tremendously in future international competitions to have gone through that. The experience of an Olympics is so important as it takes a dry run to really feel what it is about and to know how to handle it all. There is everything including the Olympic Village, the training, the difficulty getting around and then waiting in the room before you compete for about forty-five minutes without being able to really move around and warm up. There are all those things you must go through at a big international competition like the Olympics. The 1984 Los Angeles Olympics was my first time going through it and I sure could have used the prior experience. GCR: You touched briefly on the 1980 Olympic Trials where you came in with an 8:34 personal best and you won your heat in 8:28.25 in a six second PR. Then in the finals you were under your new PR pace with the giants of American steeplechase racing out there. Doug Brown was leading at the bell with Henry Marsh, Ron Addison and Ken Martin in contention. Could you take us through how you were feeling physically and mentally in the final with a lap to go and being in contention for a podium finish? JG My coach, Joe Lang, was a meticulous planner and was great at formulating race strategy. So, there was a purpose in our training and workouts for the entire year before the Trials. It went all of the way back to the fall of 1979. We started to do a lot of visualization and mental preparation that I hadn’t really done before in my running career. It was just bizarre to get to the spot where I had prepared physically and mentally for a year and now, suddenly, I’m in the final. I was thinking to myself that my first goal was to put myself in the top six with a few laps to go. Then I got to that point and I was feeling great. Then at the start of the final lap when I was there behind Henry Marsh, Doug Brown, Kenny Martin and Ron Addison, I felt that Marsh and Brown were almost unreachable. They were far ahead. GCR: Marsh took off with 300 meters to go and won with Brown second and then an exhausted Ron Addison who impeded you somewhat, but you got by for third in 8:21.32 a big seven second PR and 13 seconds under your pre-Trial’s PR of 8:34. Can you relate some details from that final lap and your finish? JG I was just feeling good and started to kick. With about 200 or 250 meters to go I had already passed Ken and I noticed that Ron was starting to falter. He still had a pretty good lead on me, but he was starting to struggle a little bit. Then I had a good water jump. When I came off the curve into the home stretch, I started realizing that I was going to catch Ron. Next it was kind of a bizarre finish because he started to stagger a bit into lane two. So, I went into lane one and he kind of fell back into me right across the finish line. I knew I was third and I was elated. But the red flag went up and officials discussed what happened and, unfortunately for Ron, he was disqualified for impeding me. I always felt badly about that because it wasn’t anything he was intentionally doing. He was just really struggling, and it was completely inadvertent. It was one of those races where the pieces all came together on the day. I can remember not sleeping probably the whole time I was at the Trials because of anticipation and nervousness. I stayed in the dorms right across the street from Hayward Field and it was a great experience. To make the team was exciting. I was a long shot, but I didn’t plan to fail. The plan was to succeed and to make the team, but I didn’t really start believing until 200 meters to go when I was closing on third place. GCR: It's interesting when you spoke of Coach Lang and the entire year of developing you because, when we look back at your sophomore year you combined the strength of a 27th place finish at the 1979 NCAA Cross Country Championships in 29:59.40 with the speed of a sixth place at the 1980 NCAA Indoor 2-mile in 8:43.66 and another sixth place at the 1980 NCAA Outdoor 1,500 meters in 3:44.1. Did that entire year developing your strength and speed combine to bring it all together for you in the steeplechase? JG First, I have to say, you’ve done incredible homework! The steeplechase is definitely a combination of strength and speed. You’ve got to have both. You really do have to have some of that cross-country strength and good leg speed from the 1,500 meters to follow that up. Everything we did in training always had a purpose. We never trained just to train. The training was meticulously planned even to the point where I didn’t race that many steeplechase races. I didn’t do that many before the Olympic Trials. We raced above and below the distance. That is why we decided that I would run the 1,500 meters at the NCAAs in Austin, Texas. Then at the AAU meet I ran the 5,000 meters. At the Trials I had the strength and speed from those races in me. We always had a mixture of 5ks, 1,500s and even some 800s. I would also run the Cherry Blossom 10-Mile road race each spring at the beginning of outdoor track season as a kind of strong tempo run and then go from there. Joe was a great planner, always had a great vision and was in charge. He would tell me the plan and how we were going to go about it and I trusted him. For me that is what I needed to do. If it was just one steeplechase after another and after the next one, I wouldn’t have succeeded. GCR: Back to your Olympic experiences. At the 1984 Olympic Trials you must have been more comfortable, and you knew how to run just fast enough to qualify for the next round. I noticed you ran 8:34.7 for fifth place in your heat and then 8:25.16 for fifth in your semifinal to make the final. With Henry Marsh and Brian Diemer your two strongest competitors, were you saving your energy and positioning yourself best for a top three finish? JG It was about managing and trying to conserve energy for the final where the plan was to have a strong move with about 500 meters to go to absolutely put myself in position which I did. Then I was able to hang on against those two guys. GCR: After making the 1984 Olympic team, what was the plan to get ready for the Olympics in a short window of time? JG That 8:18.45 I ran in the Olympic Trials final was my PR. A lot of distance runners will tell you that we do have the fairest Olympic Trials since the top three finishers go and there are no politics of picking somebody. But it does take its toll on you a month or so before the Games. Going through the Trials did wear me out. Afterward I went up to Eugene, Oregon to train and ended up getting possibly the sickest in my life I have ever been. I thought I had meningitis, but it turned out it wasn’t. I couldn’t train for a good ten days to two weeks between the Trials and the Games. Then I was able to come around again, but my confidence was completely shot going into the Games. GCR: Both of your Olympic races were slow, tactical affairs as you ran 8:38.43 in your heat to place eighth and make the semi-finals and then 8:38.19 in the semis to not advance to the final. Describe your race strategy, how both races developed for you and your thoughts on your performance. Were you in the groove at all or still suffering from being sick to the point where you just weren’t primed for a top effort? JG I didn’t have it. But I almost made the final anyway with some tactical race efforts. I was so drained from being sick. Also, I never had a ton of confidence in myself and the mental effort needed to overcome being sick and to mentally be ready made me my own worst enemy. Since I didn’t have the experience that affected me. In a perfect world you would have the opportunity to go to the Olympics twice. Once to enjoy it, let the family come with you, go to the Opening Ceremonies and learn the logistics and then once where it would be all strictly business. There is so much that goes on. It’s a great experience. Marching into the Opening Ceremonies was great but is extremely draining. There are hours upon hours of standing around, waiting and waiting. It’s exciting when we finally went into the stadium. There were family members that wanted to attend to support me and I wanted to be with them. It gets really tiring trying to meet up with everyone. Getting in and out of the Olympic Village was a hassle. The Olympic Village was on the campus of UCLA and there was nowhere to train on the campus for distance runners. We stayed outside of the Village at a good friend’s house for a while. All the logistics do a number on you. That’s why you hear stories of some athletes who stay outside of the Village until the last minute. The Village is not ideal because there are four to six athletes in a room, you must be talented and on your game, you must be healthy, you can’t be sick, and the stars have to fall in line with your training and all the logistics. I’m not sure if fans from the outside looking in realize this. Again, it’s a great experience, but it’s difficult. GCR: Did you get a chance to attend other track and field events and the Closing Ceremonies? JG I did not go to the Closing Ceremonies. I was married and during the Games I was temporarily separated from my wife and loved ones. I didn’t go to many other track events and didn’t attend any other sporting events. The track and field competitions start in the second week of the Games, so it isn’t smart to be wandering around in advance of your event. A lot of my family members attended, and they have the fondest memories of being there which is great. GCR: You mentioned your wife, and Chris was also a top runner. Can you explain the plusses of having a wife who could understand what you were going through and then the positive impact that sharing running has had on your nearly four decades of marriage? JG It’s something that we have always shared. That’s how we met on the team at Georgetown. We both completely understood each other though it was difficult in those 1984 Olympic Trials because she missed making one final by just fractions of an inch. She ran both the 1,500 meters and 800 meters. I think she let up at the wrong finish line in the 800 meters and didn’t make the final by a hundredth of a second and in the other made the final but didn’t make the team as she was back in eighth place. I would go through the ups and downs of her events and my events and she would do the same thing. It can be taxing, but it was important as we each knew the difficulty of what the other was going through, and we were a support system of each other’s running and goals. Then eventually we supported each other’s careers and put each other before anything else such as monetary things. Over the years we’ve been able to enjoy going for runs together, especially after the competitive years. The running becomes a lot more enjoyable after the competitions end and you just do it for fitness and for fun. At one point our daughter, Rachel, who is now thirty years old, developed diabetes when she was about 18 months old. So, we put on a road race for a good ten years where a lot of top runners like Judy St. Hillaire, Bruce Bickford and the Coogans would run for the diabetes awareness and treatment. My wife’s father has run forty marathons, so running is in the family. It’s been enjoyable for the fitness aspect and as something we could share together. GCR: How exciting has it been to mentor and cheer for your son, Johnny, throughout his still-blossoming running career and what have you been able to do to help him through the physical, mental and emotional highs and lows of training and racing? JG We have three children, and Johnny is one of three whom each have their own gifts. We tried to expose them to a lot of different experiences with music and athletics and academics and scouting. Both Johnny and his brother are Eagle Scouts. So, we’ve tried to give them a really good experience in their lives and Johnny gravitated more towards the running. It’s only been more recently that we’ve collaborated with Coach Gagliano and had some input. We never got involved in Johnny’s training in high school or college or even his first few years post-collegiately. We felt strongly with each of our children that, whatever endeavor they chose, they would own it and take it on for themselves. We are big believers that if parents force a child on a path that it doesn’t work, and the child ultimately must take what they are doing and make it their own. Obviously, Johnny’s gift is his running and it has been good for him to be able to bounce ideas off us, especially these last couple of years. He has tremendous coaches and athletes to train with, so he doesn’t really need much input. It might just be asking us what we think of running a certain race or the plan for some upcoming races. Coach Gagliano calls me once every couple of weeks and says, ‘This is the plan we were considering. What do you think?’ So, it’s been a neat thing to have some input. We’ve also had similar injuries and I can help with recovery and maintaining fitness. It’s been helpful for him to bounce thoughts off us and it has been exciting. We went to the World Championships and watched him race, but it was extremely nerve wracking. He can be racing in another place like out in California and I know right about the time he will be getting ready to race and I start feeling nervous. GCR: One neat occurrence, that can’t be planned, is that only ten father-son duos have both recorded sub-four-minute miles and Johnny and your personal best times now average 3:52.25 which is the fastest. Next on the list are Kip and Martin Keino, from Kenya, with a 3:52.72 average, followed by Matt and Matthew Centrowitz, with an average of 3:52.74. How cool is it to share this with Johnny and to be in the company of the Keinos and Centrowitzes? JG It is funny. When Johnny first ran his 3:53 mile indoors a couple of years ago a few people mentioned that we were the fastest father-son duo. Some people had mentioned earlier that the father-son four-minute milers was a short list. When we found out we were the fastest it was kind of fun to be able to know that. There are some who know my wife, Chris, and how fast she ran who will ask, ‘What about the fastest mother and son?’ Johnny gets his speed from his mom. It has been fun, and I don’t have a lot to do with it. Only Johnny and Matthew can lower the father and son time. Matt and I aren’t going to be doing that any more. Johnny enjoys it and we always say that as long as he is enjoying it then to go for it and that if it becomes a chore that isn’t enjoyable then it is time to move on. GCR: We met a few weeks ago at the FlRunners.com cross country meet, with more than two thousand athletes over two days, where you and Johnny were there with Asics and I was meet announcer. How joyous is it to stay in close contact with your sport through working with Asics, to feel the excitement and energy of the teenage runners and to share some of this with Johnny during his off-season? JG It’s very rewarding. Asics does such a good job of supporting the young athletes. I don’t know if I mentioned this, but my wife, Chris, and I have held a summer cross country camp for at least twenty-five years. Last summer we had about a hundred and sixty athletes. We combine the training aspect with motivational talks and how running helps with setting goals in life. Some of the camp attendees aren’t even going to run competitively in college, so we focus on the benefits of an active running lifestyle, setting goals, teamwork and life lessons the sport can teach. Since Chris and I both coached at Brown University for several years, it is great to see the sport as strong as ever and the participation. It is also fun to watch as a parent and coach and to reminisce about when I was running. My parents came to my meets and then years later I watched our children running at different meets. It brings back good memories. As I said previously, one of the great gifts of the sport is being around people who love the sport. There was a young woman coaching at one of the Florida schools who had met Johnny previously when he was younger. It’s always fun to go back and spend time with athletes we have coached in the past. GCR: Speaking of coaching, what is the challenge of coaching and helping others of various talent levels set and achieve goals versus doing it for yourself with your own talent and dedication, which was most likely at a higher level than most athletes you coached? JG When I started coaching, I was in my early-to-mid thirties, so I would still run a bit with the athletes on distance runs. As I was training with them I was passing along information and it was a gradual segue into coaching. There were the same principles of goal setting, hard work, timing and patience. I think one of the most difficult things for me to convey as a coach was how long it could take for results and how to wait and be patient. I had to communicate that we might be putting in a lot of hard work and that it still might not work out in the end. I have to find out if my athletes were willing to take the chance to achieve the ultimate goal even though they might not reach it. For me coaching was always more than the results. The advantage of having run for all those years was that my running was results-oriented and that if I had to do it all over again, I would have made it a lot more process-oriented and more about the journey. That was the message I conveyed to the athletes I coached and that we conveyed to our children. The emphasis was that if it was just about the results that it was going to be tough. But if it was about the process and the things we learned along the way there was a better outcome. Now that didn’t mean that we weren’t super competitive in the major competitions in the Ivy League and for the few athletes who advanced to the NCAAs. But I didn’t make it solely about their results. GCR: Let’s go back somewhat chronologically through your running career. When you were a youth and teenager were you competitive in many sports and when did you notice you were a good runner or develop an interest in the sport of distance running? JG We grew up in a very competitive family. My father worked three jobs and he just hoped that we would have a shot a going to college. He always motivated us. When I look back, I was always small in stature. We played football in the fall and basketball in the winter and baseball in the spring. It was a competitive atmosphere. My favorite part of football ever since I was in Pee Wee football was the part everyone else hated – the lap at the end of practice. At that time, it seemed like it was far, but it was probably a quarter of a mile. At the end of the lap I was always way ahead. The other kids hated it bit I liked it. Being able to do a fast lap around the field didn’t serve me that well in football. The key skill was how fast a player could get off the ball when it was snapped. I played all the way until my freshman year in high school. Then I tried out for the basketball team and didn’t make it. Since I wasn’t playing basketball I got ready for baseball and was doing a lot of running. I joined the track team and within the first day or two I could easily complete a six-mile run without having trained specifically for running. So, it came naturally. The coaches noticed that. My first running shoes were basketball shoes. They weren’t even the real deal. They were these fake K-Mart basketball shoes. The coaches noticed my talent and I enjoyed that because after being cut from the basketball team I felt like I wasn’t up to it athletically. I felt I was a little bit less of a person because I hadn’t made the team – at least at that age that’s how I felt. In the sport of track and field there weren’t any cuts. It was all about how much we put into it. I really liked the individual aspects and goals. GCR: Could you tell us a bit about your coaches and the type of training you started out with that first season when you were a novice runner? JG I had a coach, Hal Rothman, who later worked with Marty Liquori and Tony Reavis in broadcasting. Hal was a teacher in Long Island who got me started running. He was my freshman year coach and he had a good knowledge of the sport. There was a family in town, whose last name was Crook, and Peter Crook went on to run for Providence College and was an All-American. His brother, Kevin, I believe went to Villanova. John, the current coach at Wesleyan, was the brother that was my age. They were the running family like there was always one running family in town in each town. They took me under their wings and suggested doing double runs a day. They also took me on the weekends for runs in the local parks. So, the Crooks had a huge influence on me and my running. My junior year a coach by the name of Don Buckley came from Brooklyn where he was coach at Bishop Ford High School to coach where I was at, St. Anthony’s High School. He was just a real good motivator. He had a great attitude and was good tactically with setting the workouts. We were an all-boys school and he excelled at what it took to motivate young teenage men. He was great at that and my junior year we won the State cross country championship in New York which is no small feat, as it’s a big state, and I won the individual championship. Then I went on to run a 4:05 for the mile and to win the Golden West Invitational and I won the state championship in cross country again my senior year. He always had a positive attitude and had us feeling good about the work we were doing. GCR: There was a race your junior year in high school which may have been the first race where you had a very tight battle to the finish. At the Albertus Magnus Run at Bear Mountain State Park you and Dave O’Connor traded the lead in the last 100 meters and were both timed in 14:43.1 with you leaning to get the win. What did that race do to help you believe in yourself since you were now competing strongly with an All-American runner? JG It did a ton. Again, I came from a family that didn’t know anything about distance running. I didn’t even know who Steve Prefontaine was at that time . I didn’t know anything about running. It was very new to me in the first few years and I just enjoyed the sport and enjoyed competing. I loved to compete. There is something that happens a lot between the sophomore and junior year in high school as it is a big year of improvement for boys. My freshman year I had shown some promise, but I had leveled out my sophomore year. It wasn’t that I didn’t run well, but I didn’t do anything stellar. Don Buckley noticed something in my training and the level I was at and said to me that I could win. When he came to coach he convinced me that I could run at a different level. Going into that Albertus Magnus race he told me I could win, and I thought, ‘okay.’ Very shortly thereafter there was another big race that I won by quite a bit against a guy who I eventually went to Georgetown with, a guy named Tom Grimes. It was huge having these breakthroughs from being a decent runner to an upper level runner who was winning. I’m not sure what was in my mind or my thought process at the time, but after that first win, I would tend to just go at the gun. There are pictures of me with 50 meter leads a half mile into races. I just had this thing where I wanted to take off. There was no strategy involved. I would just go for it. JG That is exactly what the thought was. I don’t want to sound like the old fogey here, but the pace they go through the mile in college cross country meets now is pedestrian. You know this – we used to go out in sub-4:30 all the time. One year at the NCAAs we were 4:15 at the mile and I died a slow death. It was some crazy pace and all the cross-country races went out that way. Now everything is tactical. GCR: Another race that must have been a great one was on the track the following spring at the Long Island A.C. Meet of Champions when you got the baton in the four-mile relay for the anchor leg and you were about four seconds behind Rich Lippert of Walt Whitman High. Then you ran a 4:08.3 to catch him and beat him by two tenths of a second. Do you remember much from that race and trying to track him down? JG I don’t remember that race at all. My dear friend and co-worker, Jim Spivey, is the exact opposite of me. He has a great memory and has tremendous records. He would get a little frustrated with me at times with my lack of remembering some of these races. GCR: What are the high school races that still do stand out in your memory? JG The Golden West race stands out when I ran 4:05. I can picture some of the guys in the race. There were these twins that were very good. I just went out hard in that race. The one that is strong in my memory is the Penn Relays. While growing up in Long Island, all I knew about running was that the Penn Relays were everything for high school runners. My senior year the big competition for us was Trenton Central High. They won the 4 x 400-meter relay and the 4 x 800-meter relay. They were due to win the distance medley. In that race we had a good team and I got the baton about 20 or 25 meters behind Aubrey McKinnon on the anchor leg. I ran him down and ran about a 4:05 in that race. That was one of the real highlights of my high school career. GCR: What was your training mileage like in high school and what were some of your key workouts? What were the major changes when you matriculated to college? JG Honestly, back then the training wasn’t that complicated. There were 400-meter repeats. We would do twelve times 400 meters with a two-minute jog. Another one that a lot of teams would do back then were to run repeat 200 meters and then just cross the field in between. I don’t think tempo running was a concept then. I’m sure that we did hard distance runs, but there was no plan to run at a certain tempo or a threshold. It was before all those ideas. We just did 10-mile runs and repeat 200s and 400s on the track. We sometimes did repeat 600 meters. It was very simple. To this day I believe that a lot of training is way more complicated now than it has to be. I know about heart rate training but, even when I coached, it was more old school. There were many repetitions with short recoveries. In college I got hurt my freshman year from that jump up in distance to the five mile and 10,000-meter races. The sheer volume was challenging. The training wasn’t that different at Georgetown from St. Anthony’s. On the track we did 300s, 400s and 600s. We did more tempo running, especially during cross country season in college. When I was at Georgetown, we were training more like track runners who ran cross-country than as cross-country runners. A lot of it was based on track season. If we did twelve repeat quarter miles during track season, then we would do 16 repeats in cross country. We would add some tempo runs and 10-milers and pump up the volume. We were primarily a good track team that had an okay cross-country team. GCR: In cross country you were the 1979 and 1981 Big East Conference individual champion and you were 27th at the NCAA championship in 1979 followed by a 25th place finish in 1980. Did you find that the strength you gained from racing five miles and 10,000 meters served you well during track season? JG I wasn’t a real big fan of those long distances. But, going back to your comment about the Big East, I share something with people that is a bit funny. I won the very first Big East championship of any kind because the Big East was started in 1979 and so the first championship was cross country. That was an incredible race. I was surrounded by Ray Treacy, Brendan Quinn, Jeff Smith and other Providence College guys. We were out at some crazy pace through the first mile and the three-mile point. I think I ran a 22:30 or something crazy like that for the five miles. But I was hit or miss in cross country. My freshman year I had a good run at Lehigh. I always found that the jump between five miles and 10k for me was huge. Even with that little of a distance I would have a much more difficult time moving up from five miles than you would think, but I did. It also took me a lot to recover from a cross country race since I was a toe runner. My calves would be screaming for a good week. If I had to go back to back in races in cross country that were a week apart it was tough. It wasn’t something where it always clicked. I was inconsistent in cross country. GCR: We talked a bit about how you ran many different race distances. You were an eight-time NCAA All-American, and only once was in in the 3,000-meter steeplechase which was in 1981 when Solomon Chebor of Farleigh Dickenson won in 8:23.34 and you were second just behind in 8:24.66. Do you recall much about your only NCAA steeplechase All-American race? JG I remember being in the race. I raced Solomon Chebor a few times because he was in the IC4A and we actually raced kind of a lot. That was one time I had a shot at him, but I couldn’t nail it down for an NCAA championship. My coach and I always had a plan, so we would jump around in distances. There was always a longer-term goal and sometimes it wasn’t the NCAAs. It might have been a little bit frustrating to have not won one in that event, but I only ran it twice. I ran the steeple twice and the 1,500 meters twice at the NCAAs. GCR: The following year in 1982 your Georgetown team did win the NCAA indoor distance medley relay. So how exciting was it to bring home a Gold Medal at NCAAs? JG It was exciting. I loved the relays and the team races. I like going to the Dartmouth Relays and the Penn Relays and the Colonial Relays. Running and winning a relay at the NCAAs was extremely great to be able to do so and to share it with a few guys on the team. I enjoyed those team wins more than the individual wins back then. GCR: When I interviewed Marty Liquori, we chatted about his nine Penn Relays wins which were three years in a row of being on three relays champions. Speaking of the Penn Relays, how exciting was it in 1982 when you anchored the Georgetown distance medley team which ended Villanova's 16-year distance medley winning streak at the Penn Relays, with you coming from behind and beating Villanova's anchor and celebrated runner Ross Donoghue by two meters? JG That was extremely rewarding because we did it with some teammates. Kevin Byrne went to Georgetown the year before me and was a big influence in my decision to go to Georgetown. He was there with a coach where I really liked his philosophy and manner. I was also recruited by Maryland and almost went to West Point, the military academy. I was recruited by many schools, but Villanova didn’t really pay much attention to me. And so that didn’t sit well with me. I was hoping to beat them, especially at the Penn Relays, because that meet is so important to them. After the race I was looking over at my Coach Joe Lang who was on the turn. He wasn’t a super emotional guy, but he had a tear in his eye and so it meant a lot to him. My family was there, and it was a great experience. It was great fun. GCR: Continuing with your theme of racing at varied distances, at the indoor and outdoor Big East and IC4A Track and Field Championships, you won the 800 meters, 1,500 meters, 3,000 meters and were on winning 4 x 800-meter relays and distance medley relays. You even won a 10,000 meters outdoors. There were no steeplechase victories. Did you enjoy racing such a variety from 800 meters up to 10,000 meters? JG That is the reason I liked the steeplechase. Since I grew up playing so many sports, I found it monotonous to be racing the same distance over and over again. I enjoyed challenging in all the different distances. I really loved the steeplechase because we didn’t just run, but we had to jump over barriers and jump over water. That was the real attraction to me. That variety was very different than flat running. I enjoyed how it broke up the running. We did a lot of that. We would run one steeplechase early in the season. Since the steeplechase can beat you up, and because I was a big runner, the steeplechase would beat me up. So that is another reason we limited it as well. So, I really loved running all the different events. 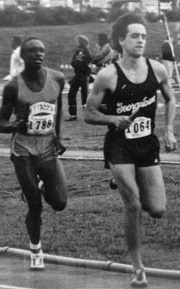 GCR: You mentioned your friend, Jim Spivey, and at the 1982 NCAA outdoor meet you raced the 1,500 meters in 3:46.40 for second place behind Jim ‘s 3:45.42 when he won. Was that one where you had a realistic shot to win or did Jim just have to much of a kick? JG He had too much of a kick. It’s funny because we are like brothers now in our lives. We didn’t know each other in high school and didn’t cross paths. There was another big high school meet in the midwest, the International Prep Invitational, that he ran while I competed at Golden West. Then in college he might go to the Drake Relays while I was at the Penn Relays. We heard about each other but didn’t race each other. Then in college we did race each other a few times. That NCAA race with Jim was at altitude, which was tough, so it became tactical. Once it became a tactical affair, there was no way I was going to outkick him. He ended up coaching at the University of Chicago and Vanderbilt while I coached at Brown. We both had a relationship with Asics. Jim ran for them and I started doing some consulting for them at the Olympics and other events. We got to know each other a little bit more. Asics has been a long-term sponsor of the New York City Marathon, so we roomed together in New York and just became fast friends and true brothers which is kind of neat. GCR: In the early 1990s you started transitioning to longer road races including a 2:16 marathon. What did you do differently in training and how did the transition play out? JG I was never really consistent. I would have some road racing success at 10ks and then I could easily not have a good race. One thing I think I would have liked to have tried was a marathon earlier to see how it went. I ran my 2:16 when I was 35 years old and it would have been interesting to have done marathons when I was in my late twenties or right at thirty years old when I was in good 5k and 10k shape. It was a challenge. In training I just bumped up my mileage and did many of the same workouts. I did longer runs. I chose the marathon I ran in Long Island because it was going into the Olympic year and I was hoping to qualify for the Olympic Trials in the marathon, which I did. I wanted it to be a race where everything was controlled, and I could easily get my water bottles. So, I went into the marathon with that attitude. GCR: Was the full marathon distance relatively easy because of the slower pace or did you encounter the infamous ‘wall’ in the latter stages of the race? JG I do remember how surprised I was at how easy it was for the first ten miles and through the half marathon. Even after 17 or 18 miles I was thinking, ‘This whole marathon thing is overblown. This is not that difficult.’ Then I remember getting to twenty miles and my thoughts changed to, ‘Oh, oh – wait a minute!’ Then as I went through 21 and 22 miles and into the last couple of miles I was thinking, ‘Just get to that next telephone pole!’ That was when I realized that this was what the marathon was all about. When people say the race begins at 20 miles, they are giving an accurate depiction of the marathon. GCR: With the luxury of hindsight, is there anything you could have done differently in training and racing focus that may have resulted in better performances or do you think you pretty much nailed your potential? JG I feel like, for the most part, I got the best out of me. Again, I was extremely blessed to have the people I did in my life. I had great coaches and I wouldn’t want anything to be different. Maybe I could have been a little bit more confident. I didn’t always believe in myself as much as I should have. But I have no regrets. Everything has happened because of the decisions I made. Primarily, meeting Chris and marrying her and having our family, which means everything to us, and the friends we made through running. In terms of my ultimate capability, I feel like I hit the potential that I should have hit. GCR: Who were some of your favorite competitors and adversaries from your professional career, collegiate days and when you first started in high school competition for the spirited races and maybe because they helped bring out your best? JG In high school there was a runner named Otis Sanders and he was a very good runner from Freeport High School. I don’t know if he raced much collegiately, but he was a good distance runner. He was always somebody that always brought out the best of me in high school. My senior year in cross country we raced the State meet against each other and were way ahead of everybody else. We were side by side the whole race and I only puled away from him in maybe the last one hundred meters. He was super nice and that was a component I loved about running that I didn’t experience in other sports when I was growing up. I couldn’t believe that once the races were over we would be congratulating each other and talking to the runners from the other teams. It was so neat how that went on and I loved that part of the sport. Collegiately, it was always tough racing the Villanova guys – Don Paige and Mark Belger and Sydney Maree. The Providence College guys was always tough. 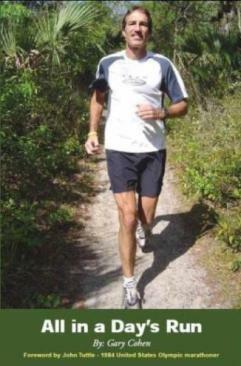 Steve Scott was someone I looked up to when I became more involved in running. My competitors were phenomenal runners and very good people as well. GCR: What is your current health and fitness regimen, and do you have any inclination to compete again as a master’s road runner or in age group track in the future? JG I’m pretty much trying to stay healthy. My ongoing joke with Chris since I stopped competing is that every birthday I say I’m not running anymore. I tell her I’m going to get my exercise from playing tennis and golf and other activity. But for the last twenty plus years I’m still running. I don’t have any real interest in competing in any way, shape or form. I just enjoy getting out there. We will run together and talk about our day and what’s going on in our lives and what we have coming up. I get out to run about three days a week. I’d like to get out more, but that’s kind of where my running is at now. I run my three days a week and we usually go four or five miles. Today we ran six miles, which is a big run for me these days. I find I feel so much better, mentally and physically, when I get out there and run. For me, running is still my favorite exercise. I do enjoy biking. I don’t do the biking like some former runners who really get into it at a high level. I’m just talking about leisurely biking. I try to stay healthy and fit, so I can eat my hot fudge sundae. If I didn’t run I would probably balloon up fifty more pounds. GCR: I was raised in the Catholic faith, so we have that background in common. How did your Catholic faith help you as a youth with other aspects of life like structure and discipline and how has that carried on as you have become older and wiser as an adult? JG I always went to Catholic schools when I was growing up. I went to Catholic grammar school and high school and college. I very much took my faith for granted though. I would go to Mass on Sunday and it formed and shaped me in my younger days even though I took it for granted. More in the last twenty or thirty years I’ve become extremely involved in my faith and I teach religious education. I realize how important my faith has been in my life and it means the world to me. It is the guiding light in my life and is how we raised our family. Our Catholic faith is everything to us. JG Life is about making sacrifices and living for the other. It’s something I am continuing to try to do and I don’t do a good enough job at it. I spent a good part of my early life thinking that the goal was to be successful at running or at my job and in making money and providing financially for my family. In reality it’s all about sacrificing and making decisions that aren’t always the easy decisions but are the decisions that are the doing the right thing. Trying to put my wife, Chris, before me and to put my children before me and knowing that there is a purpose for me to provide a faith foundation for my children is important. It’s not about the size of our house or the car we drive. Obviously, it’s important to provide for your family, but the most important thing you’re going to give them is the guiding light of their faith. Especially, when times get difficult, and when we combine with the running lessons, it’s all about falling down. It’s how we bounce back and get up after falling down that’s important.